Like it or not, autumn is here, and we are fast approaching winter and all of the cold and wet weather that that entails. Although our gardens are used less frequently as places to rest, play and entertain over the winter months, it’s important that we look after them to ensure that they are happy and healthy when the warmer weather returns next year. One of the most important things you can do to keep your garden looking its best at any time of year is clearing debris. Removing weeds and leaf debris will keep your lawn looking green and healthy, and the less hospitable you can make your garden for winter pests, the fewer problems you’ll have with them in the spring. It’s also important to cut back perennials by removing any dead foliage, as well as removing any spent annuals and seasonal vegetables. Remember to remove the roots when it comes to annuals and vegetables, as they won’t return next year, and these can then be added to your compost bin. 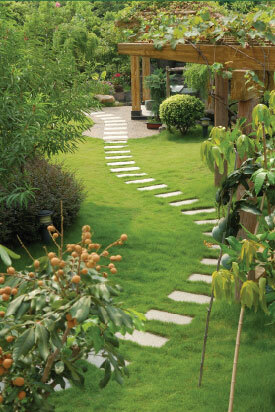 Now is the time to look after your lawn so that it’s revitalised ready for the spring. Aside from removing any debris, if you have a lot of moss, think about removing this with a thin rake and / or a moss killer. Reseed any bald patches, or lay new turf if necessary, and in any areas which receive a lot of water, improve drainage and aeration by making deep holes with the prongs of a garden fork every 10cms or so. Then apply an autumn lawn feed to your entire lawn to replenish it over the winter months. Now is the time to plant evergreens, which will give your planting scheme some backbone and provide some year round interest. By planting evergreens in the autumn, you’ll be able to clearly see any gaps in your borders, and can choose the right plants to fill them. If you need any advice on this front, instruct a garden landscape company to help bulk out your borders. Now is also the time to plant some spring bulbs! Add some colour to your flowerbeds by planting tulips and daffodils, ready for when the winter weather subsides. Check all of your fencing, patios and other hard landscaping structures now and carry out any necessary maintenance, before the weather gets too cold and wet. Instruct a specialist fencing company to fix any cracked fence panels or leaning fence posts, and fix any loose paving stones. This will help to protect your hard landscaping against cracking or water damage when the weather becomes particularly cold, wet or icy. If you’re unsure what you need to do in order to get your garden ready for the cold weather ahead, speak to a specialist landscape gardening company. We can help to ensure that gardens are protected against the cold weather, and are winter ready.